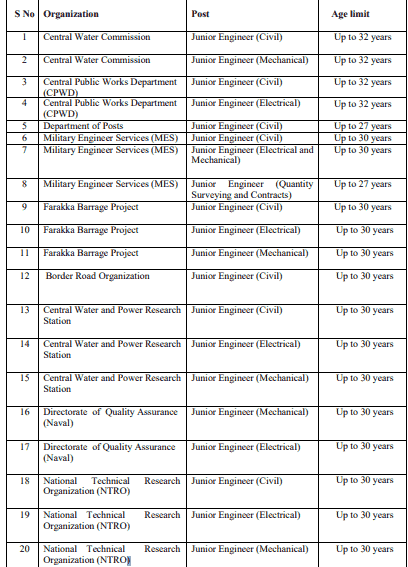 SSC Junior Engineer Recruitment 2019 Application form: SSC has recently announced notification for the recruitment of Junior Engineers (Civil, Mechanical, Electrical & Quantity Surveying and Contracts) in various departments and ministries of Govt. of India. Application forms are currently available on SSC website and interested candidates are advised to fill the application before the due date. Paper I examination is scheduled to conducted in the month of September 2019. Before filling online application, all the candidates are advised to go through the eligibility criteria. Candidature of candidates will be canceled in case they are found ineligible at any stage of recruitment. A person of Indian origin Burma, Sri Lanka, Pakistan, Zambia, East African countries of Kenya, Uganda, the United Republic of Tanzania (Formerly Tanganyika and Zanzibar), Malawi, Zaire, Vietnam and Ethiopia for settling permanently in India. An age relaxation is applicable for various reserved category candidates. Click on “Register Now” provided in the Login section of the homepage. Now provide all the details such as email, Mobile No., personal details, educational details etc. and confirm the details. A registration ID and auto-generated password will be sent to the registered mobile No. and email will be used as username. Candidates have to log in again with the registration ID and have to change the auto-generated password. Now candidates have to log in again and have to fill all the details. They have to upload all the required documents as per the prescribed format. Review the information filled and click on “Final Submit”. Click on “Confirm” and different OTPs will be sent to the registered Mobile No. and email. Enter the respective OTPs and complete the registration procedure. Log in by using the registration ID and password. Click on the “Apply” in JE 2019 examination link provided under the “Latest Notification” tab. Application form will appear and fill the remaining information that is required. Preview & Verify the application form after filling all the information and click on “I agree”. Make payment (if not exempted from payment) and application will be submitted finally. Candidates can take printout of application form for their record but it is not required to be submitted to the office of Commission. Candidates have to pay an application fee of Rs.100/-. Women, Ex-Serviceman, SC/ST, and PWD candidates eligible for reservation are exempted from the payment of application fee. Candidates who will qualify Paper II will be shortlisted for Document Verification. Shortlisted candidates have to be present the verification center on the specified date and time with all the documents in original. Candidates also have to submit the copy of all the documents and certificates like Matriculation Certificate, caste certificate, experience certificate, educational qualification, relevant document and other relevant documents at the verification center. Final selection will be made on the basis of performance in Paper I & paper II and preferences for department/posts exercised by the candidates at the time of verification of documents. Syllabus for Paper II is similar to paper I. 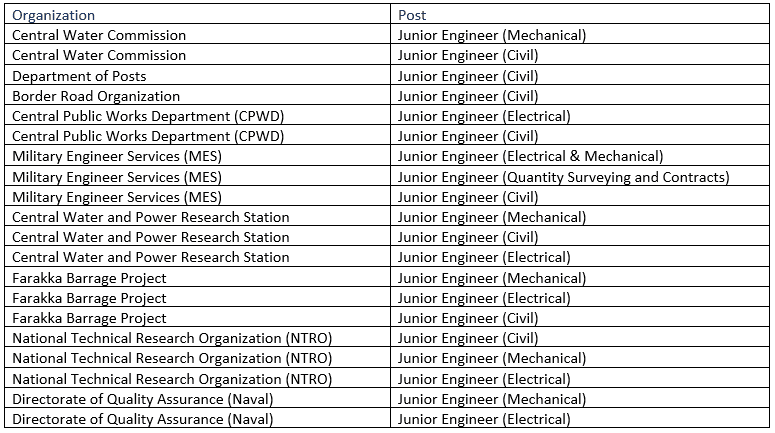 Candidates can refer https://ssc.nic.in/SSCFileServer/PortalManagement/UploadedFiles/notice_eng_jemec_01022019.pdf for detailed information about Paper II syllabus for all the parts. Admission certificate i.e. admit card for all the stages/exams will be updated on the website of concerned Regional/ Sub-Regional Offices of the Commission and candidates have to download it from there only. No, admission card will be sent through post to any candidate. Candidates must visit SSC official website i.e. https://ssc.nic.in on a regular basis to get the updates. Candidates have to carry the admission card to the exam center along with a valid photo ID card and two passport sized photographs. Candidates without admission certificate and other required documents will not be allowed to enter the examination hall. Candidates have to fill preferences for the desired exam center at the time of application. Below we have shared the list of SSC regions and all the exam centers falling their jurisdiction. Candidates are advised to indicate the preference for exam center carefully in the application form as no request for change in center will be entertained later under any circumstances. After the commencement of examination, answer key will be uploaded on the website of the commission. If any candidate wants to fill representation against the answer they can submit representation through the online mode within the given timeframe. Candidates have to make payment of Rs.100/- per question. Commission will not entertain any representation after the due date. After the declaration of result or selection list, Commission will also release the cut off marks list. The cutoff list will be different for all the categories. The final result will be prepared on the basis of performance of the candidates in Paper I Paper II and after the process of verification of documents. If you have any question then you can tell us in the discussion box below. Our expert team will help in you solving it.